I can't believe you manged the courage to approach them. Incredible capture. Thanks for sharing the story Pamela. Fascinating information. I had no idea these were Africa's most dangerous animal. Who would have known, they can really move quickly. Fabulous capture of these hippos. L.
What a pose! Great and wonderful capture! What a wonderful scene! How nice to see hippos in their natural habitat! A unique outstanding capture of an unusual hippos meeting. What a great wildlife shot! I love hippos! Super shot, never seen so many in one place! 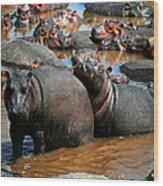 That's a lot of hippos! Fantastic capture! What a neat image Pamela. Sure wouldn't want to be in the middle of that mass chaos. LOL. Awesome capture - love hippos! They were my husbands favorite! 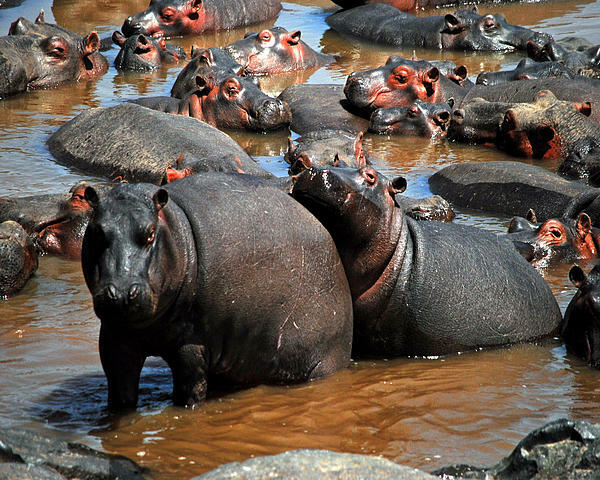 A large pod of hippos relax in the sun and water at Masai Mara National Reserve in southern Kenya. During the day hippopotamus will spend the day relaxing in the water and at night they will leave the water and graze on the savanna. The pink and reddish color that develops on their skin is a result of their skins sensitivity to the sun. Pamela Peters is the owner of Wild Radiance Photography. She is a wildlife and nature photographer from Richmond, KS. She is also an author and public speaker.